WASHINGTON — An energy boom that has created a sharp increase in rail freight traffic nationwide is causing major delays for Amtrak passenger trains and is holding up the transport of vital consumer and industrial goods, including chemicals, coal and hundreds of thousands of new American cars, rail officials and federal and state regulators say. American rail lines now move more than a million barrels of oil a day, much of it from the Bakken shale oil field in North Dakota and Montana and from the oil sands of Alberta, Canada. Last year about 415,000 rail cars filled with crude oil moved through the United States, compared with 9,500 in 2008, according to the Surface Transportation Board, a bipartisan body with oversight of the nation’s railroads. In large part as a result, long-distance Amtrak passenger trains are now late 60 percent of the time, Amtrak officials said, compared with a year ago, when the trains were late 35 percent of the time. The problems are particularly acute on long-distance passenger lines like the Empire Builder, which shares tracks with freight traffic from Chicago to Portland, Ore., and is late nearly 70 percent of the time. Trains on the 47-hour trip typically run three to five hours behind. Revenue from the line has dropped 18 percent from last year, Amtrak officials said, as word about the sluggish service spread among passengers, most of whom use the Empire Builder for shorter trips between cities on the route. “Clearly, we’re not getting the level of service that we want to give, or what our customers have been used to getting over the last decade,” said Edward R. Hamberger, president and chief executive of the Association of American Railroads, an industry trade group. Delays are not as serious for rail service along the Northeast Corridor, where Amtrak owns most of the track between Washington and Boston and has more control over passenger service. On long-distance routes, Amtrak passenger trains run on tracks owned by the major freight railroads. On the long-distance routes, aging tracks and a shortage of train cars, locomotives and crews have also caused delays, rail officials said. In addition, an improving economy has meant more goods shipped by rail over all. Rail accounts for 40 percent of all goods moved in the country as measured in ton-miles, derived by multiplying a cargo’s weight by the distance shipped. Trucks are second at 28 percent. A proposed pipeline to move oil from Canada would alleviate some of the rail congestion but would not eliminate it, officials said. 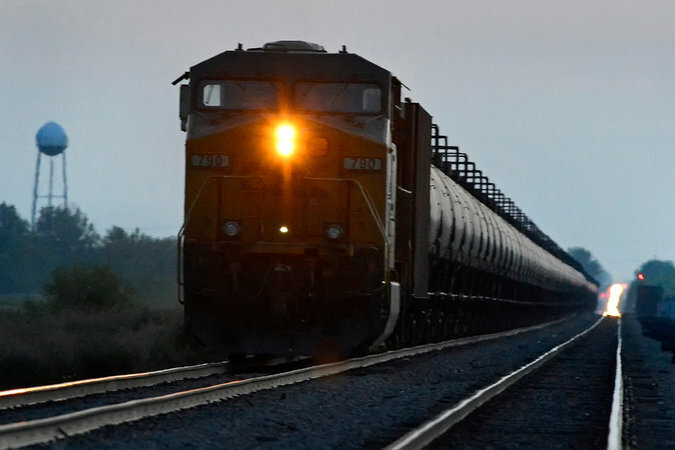 Although North Dakota has been known within the industry for a surge in moving oil by rail, and resulting delays in grain shipments for farmers, rail officials say the congestion and late passenger trains have spread to many other states. On Wednesday, the Surface Transportation Board announced that the nation’s largest railroads must file public weekly reports about their performance, which the board said would give rail customers a better sense of the magnitude of the delays. The problems are only expected to get worse. American coal exports to countries like China, which are picking up as domestic demand falls, will also compete for space on trains, as new coal export terminals are planned at several ports in the Pacific Northwest. (Increased Asian demand for coal reached record levels in 2012 and continues to be high.) In the United States, a record harvest of corn, soybeans and wheat is expected this year, adding to the stress on the nation’s rail network. “It’s like having a fire hydrant hooked up to a garden hose,” said Mike Steenhoek, executive director of the Soybean Transportation Coalition in Iowa. Railroad executives say they are working to unclog the congestion. Michael J. Trevino, a spokesman for the Burlington Northern Santa Fe line, owned by Warren Buffett, said the company had committed $5 billion for rail expansion and track maintenance to help improve its service. The money includes about $300 million over the next three years to improve capacity and beef up the rail system in North Dakota, which Burlington Northern Santa Fe said would bring 300 more employees to the state and lead to smoother operations and faster deliveries. Mr. Trevino said B.N.S.F. was also making improvements to its tracks in Missouri that carry coal trains coming from Montana and Wyoming. Thomas L. Lange, a spokesman for Union Pacific Railroad, said the company was buying about 229 new locomotives and hiring about 3,200 additional train crews to help deal with the increase in demand for service. A major speed bump in the nation’s rail congestion is Chicago, a transit point for six of the nation’s seven biggest railroads. Nearly half of what is known as intermodal rail traffic — the big steel boxes that can be carried aboard ships, trains or trucks — travels through the city. The congestion in Chicago is also caused by track sharing among freight, Amtrak and commuter trains. The railroads and local, state and federal officials have committed $3.2 billion for 70 construction projects to replace rail intersections with overpasses and underpasses, in an effort to smooth the flow of traffic for the 1,300 freight and passenger trains that travel through Chicago each day. The project will also separate tracks now shared by freight and passenger trains at critical spots. Officials said about 22 of the projects had been completed. In total, railroads will spend about $26 billion this year to upgrade the rail network and hire new workers, said Mr. Hamberger of the Association of American Railroads. Despite the improvements, many industries say they still suffer delays. In April, the auto industry said it had more than 200,000 new cars in storage because of a shortage of trains to move the vehicles. “Since the summer, we are seeing progress, but automakers are entering the fall with a backlog of new cars to transport by rail,” said Gloria Bergquist, vice president of communications for the Alliance of Automobile Manufacturers, the auto trade group. About 70 percent of new vehicles are moved by rail, according to the group. Industry officials say they are moving more cars by truck as a result of the rail congestion. But trucks are a more expensive method of moving the cars, a cost that may eventually be passed on to customers.